PHNOM PENH, Jun 20 2013 (IPS) - The violence that defined Cambodia during the years of the Khmer Rouge (1975-1979) may have been relegated to the realm of history, but the actions of the ruling party ahead of the Jul. 28 election smack of the dirty politics that once ruled this Southeast Asian country. Observers and analysts predict that the ruling coalition of the Cambodian People’s Party (CPP) and the FUNCINPEC Party will win, thereby adding another five-year term to Prime Minister Hun Sen’s 28-year reign. But that has not stopped an ugly face-off between the CPP and its main competitors, the Sam Rainsy Party (SRP) and the Human Rights Party (HRP), which last year consolidated their power under the umbrella of the Cambodian National Rescue Party (CNRP) and now hold 27 out of 123 parliamentary seats. In response, the 12-member permanent committee of the National Assembly, whose members all hail from the ruling CPP, decided on Jun. 5 to strip 29 legislators, 27 of whom belong to the opposition, of their political power, citing a constitutional clause that bans lawmakers from “party hopping” in order to form mergers. Within days the ruling coalition had also launched a smear campaign against Kem Sokha, current acting president of the CNRP, claiming that he had denied the existence of the infamous Tuol Sleng prison where over 20,000 Cambodians were executed during the Khmer Rouge years. CPP politicians claim to have a digital recording of Sokha calling the prison, which doubled up as a torture chamber, a hoax cooked up by the Vietnamese. Local media outlets quickly ran with the story, but the CNRP vehemently denies the allegation. “Kem Sokha, more than anybody else, knows about the reality of the Khmer Rouge as both his parents were killed by them,” Mu Sochua, president of SRP Women’s Wing and CNRP’s public relations executive, told IPS. 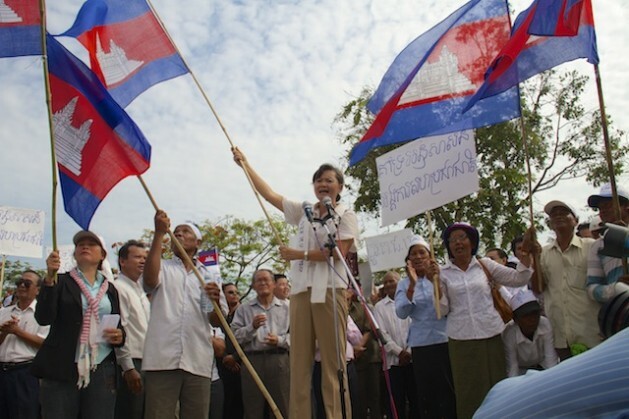 According to Sochua, the recording is a fabrication, designed to frame Sokha and weaken the growing strength of the opposition coalition, which has been drawing scores of supporters to its rallies, including most recently a 2,000-strong demonstration in the capital, Phnom Penh, and a 3,000-strong march in the northwestern city of Battambang. Initial reactions to the allegation suggested that the attempt to discredit the opposition was working: on Jun. 9 the ruling coalition amassed 6,000 people at a protest in Phnom Penh’s Freedom Park against Sokha’s so-called “denial” of Khmer Rouge rights abuses. But Tola Moeun, head of the Community Legal Education Centre (CLEC) who witnessed the event first-hand, said he talked to demonstrators who had been offered five dollars each to attend, a small fortune in a country where 49 percent of the population of 14 million people live on two dollars a day or less, and 26 percent lack adequate food and nutrition. Moeun told IPS that other so-called demonstrators admitted to joining the protest simply because they had been promised a tour of the Tuol Sleng Genocide Museum in the capital, and not due to any loyalty towards the CPP. Election observers say it will take more than a smear campaign to derail the opposition, whose strong human rights platform and support of labour and land struggles parallels burgeoning nationwide grassroots movements. Land has become a pivotal issue in a county where 80 percent of the population is involved in subsistence farming but 20 percent of agricultural families are landless, due in part to the government’s scheme of leasing millions of hectares of agricultural land to mammoth multinational corporations. Land rights activism is on the rise: the Cambodian Grassroots People’s Assembly (CGPA) that emerged in response to lack of civil society representation at the 2012 ASEAN Summit has collaborated with the internationally renowned Boeung Kak lake activists to mobilise thousands. The civil society group Licadho noted that 2012 was a particularly bad year for human rights. Labour violations topped the list after a provincial governor shot three factory workers during a strike in the town of Bavet, all of them members of the growing Free Trade Union. While activist networks are careful to avoid political affiliations in order not to be seen as “anti-government”, the strength of people’s movements has not been lost on the ruling coalition, whose decision to disempower the opposition came just a few days after a major demonstration by 3,500 workers at a Nike factory in the southeastern province of Kampong Speu. Besides their obvious popularity among activists, the CNRP has also attracted a growing number of youth, as a quick look at social media platforms like Facebook and Twitter indicates. According to Thida Khus, executive director of SILAKA and representative of the Cambodia Women’s Caucus, youth now comprise 36 percent of the population, representing a sizeable demographic and a crucial vote bank. The opposition has also made good use of social media to circumvent a virtual monopoly over the dissemination of information, said Sochua. But SRP has capitalised on this media blackout: as of Jun. 18, Sam Rainsy, currently in exile due to pending prison charges that human rights groups say are fabricated, was leading the social media race with 80,000 “likes” on Facebook, compared to the premier’s 68,465. While social media has not previously been seen as a strong indicator of public opinion, Internet penetration has grown tremendously since the last National Assembly election held in 2008, and now represents a reported 2.7 million Cambodians, according to the ministry of posts and telecommunication. Still, Khus is concerned for the safety of CNRP members, particularly since there are “no international observers for the election,” she told IPS. Being stripped of their status as members of parliament means the opposition lawmakers have not only lost their salaries but also their parliamentary immunity, which could impact their ability to safely speak to international press against the ruling party. The CNRP meanwhile filed a complaint on Jun. 17 with the Constitutional Council that the ruling party’s actions violate Cambodia’s constitution, adding that the CNRP is considering boycotting the election if the matter is not resolved. When were dirty politics not practiced by the ruling authorities in Cambodia? This pattern was established by Sihanouk shortly after independence when he abdicated the throne and set up his dominant Sangkum Reastr Niyum party/patronage group; it has continued ever since in one form or another. Cambodia has no history of democracy and political fair play as defined by the Western world and there is no sign that this legacy will disappear any time soon.